Figure 7. The decline rate of existing oil production within total world oil production will increase with time. This is because more fields go into decline as time goes on. To illustrate, consider three identical oil fields that start to decline at three different times, each with a 12% decline rate, similar to the average 13% found typical for Norway. In this example, the overall decline rate starts at zero and progressively increases. 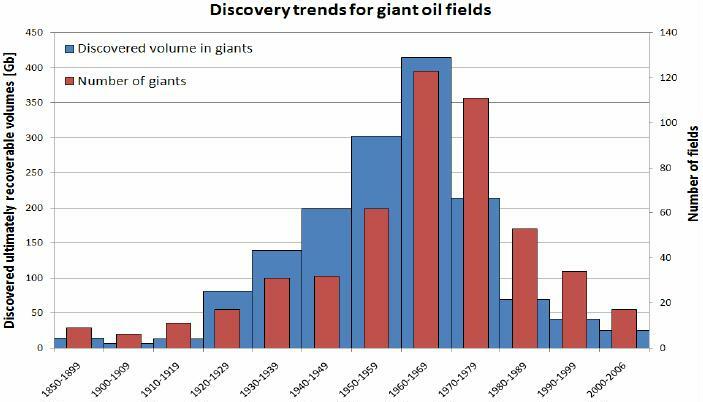 Analysis of our 331 giant field dataset going back in time showed that the world average decline rate was near 0% until roughly 1960, when overall decline began to increase, as more and more giant oil fields left the plateau phase. Thereafter, production from new giants failed to compensate for the declines of existing giant production. The average decline rate of the giant oilfields was found to increase by around 0.15% per year. Extrapolating the 1960-2005 trend yielded an average decline rate of nearly 10% by 2030 (Figure 10). This giant field trend should have a strong influence on the future global decline rate in oil production. Non-OPEC decline rate in 2030 is likely to be 11%, OPEC decline rate only 8% for reasons further explained below. The production-weighted decline rate has been behaving somewhat differently, especially since 1985, compared to the average decline rate. The reason for this change is the introduction of new technologies, most notably horizontal drilling and fracturing techniques, in many major fields in former Soviet Union and the Middle East. Using new technologies, it was possible to halt the decline in many giants and keep production stable for some time. Eventually the average and the production-weighted declines must follow each other. The currently stable production weighted decline cannot be expected to continue far into the future, once technology-enhanced fields reach the final onset of decline. The world has had a false sense of security, temporarily created by decline-delaying technology introduction in underdeveloped fields. Figure 10: The decline rate of the world’s giant oilfields. The trend toward an increasing average decline rate is very clear and explained by an ever decreasing volumes of newly discovered and declining production from new giant fields. The time period 1973-1982 was disregarded since production was deliberately reduced during that period by OPEC. The divergence between the two decline rates after 1985 is caused by the introduction of new technology and the revival of giant fields in primarily Middle East and Russia. As more giant fields go into decline in the future, the average decline rates for all giants will increase. This situation is shown in simple terms in Figure 7. Since the 1970s, the share of giant oilfields in decline has increased, showing the overall maturity and lack of new fields brought into production. Many giants have been in production for many decades without reaching the onset of decline, but sooner or later they will eventually do so. By 2030 one can expect 80% of total giant oilfield production to come from fields in decline, if one extrapolates the trend since 1985. The share could be even higher when important OPEC “super giants”, such as Ghawar or Safaniyah, leave the plateau phase in the intervening years. The most important contributors to the world’s total oil production are the giant oil fields. Using a comprehensive database of giant oil field production, the average decline rates of the world’s giant oil fields are estimated. Separating subclasses was necessary, since there are large differences between land and offshore fields, as well as between non-OPEC and OPEC fields. The evolution of decline rates over past decades includes the impact of new technologies and production techniques and clearly shows that the average decline rate for individual giant fields is increasing with time. These factors have significant implications for the future, since the most important world oil production base– giant fields – will decline more rapidly in the future, according to our findings. Our conclusion is that the world faces an increasing oil supply challenge, as the decline in existing production is not only high now but will be increasing in the future. It is well known that oil production from many oil fields worldwide is in decline and that more fields transition into decline each year. In roughly mid 2004, total world oil production ceased to expand. 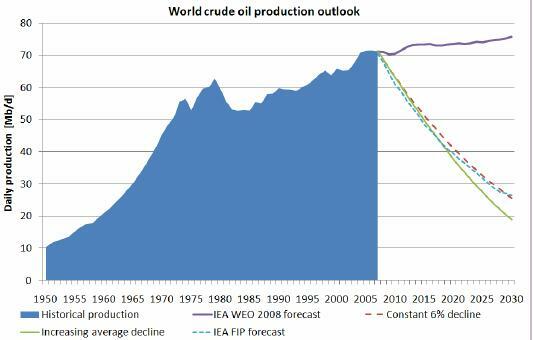 Instead, new production has only succeeded in keeping world oil production relatively flat (Figure 1). A recent analysis by Cambridge Energy Research Associates estimated that the weighted decline of production from all existing world oil fields was roughly 4.5% in 2006 (CERA, 2007), which is in line with the 4-6% range estimated by ExxonMobil (2004). However, Andrew Gould, CEO of Schlumberger, stated that an accurate average decline rate is hard to estimate, but an overall figure of 8% is not an unreasonable assumption (Schlumberger, 2005). T. Boone Pickens (2008), agreed with Gould in recent testimony before the US Senate Committee on Energy and Natural Resources. Duroc-Danner (2009) gives a blended average decline rate for oil and gas today of about 6%. The International Energy Agency (IEA) came to the conclusion that the average production-weighted decline rate worldwide was 6.7% for post-peak fields (IEA, 2008), which means that the overall decline rate would be less, since many fields are not yet in decline. Giant oil fields are the world’s largest. There are two ways to define a giant oil field. One is based on ultimately recoverable resources (URR), and the second is based on maximum oil production level. The URR definition considers giants to have more than 0.5 Gb of ultimately recoverable resources. The production definition assumes a production of more than 100,000 barrels per day (b/d) for more than one year (Simmons, 2002). In this analysis we consider the worlds conventional oil fields, regardless of location, e.g. shallow or deep water, the Arctic, etc. Conventional oil fields refer to reservoirs that dominantly allow oil to be recovered as a free flowing dark to light-colored liquid (Speight, 2007). Consequently, heavier crude oils that require special production methods are excluded. Using our definition of giant oil fields, we find that roughly 500 (about 1% of the total number of world oil fields) are classified as giants. Their contribution to world oil production was over 60% in 2005, with the 20 largest fields alone responsible for nearly 25% (Figure 2). Giant fields represent roughly 65% of the global ultimate recoverable conventional oil resources (Robelius, 2007). Many studies have pointed out the importance of giant oil fields, for instance Campbell (1991), Hirsch (2008), Meng and Bentley (2008). 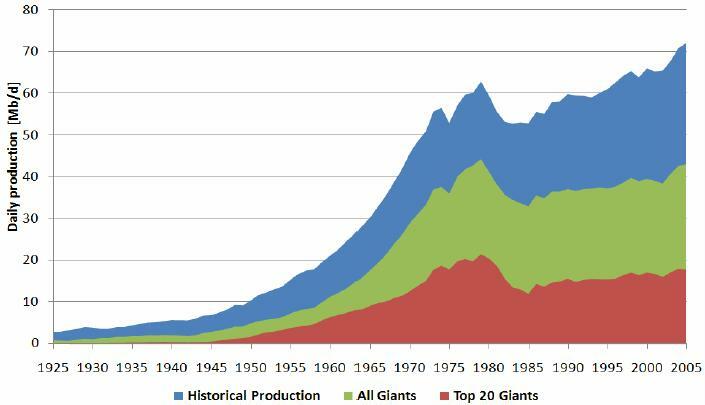 The overall production from giant fields is declining, because a majority of the largest giant fields are over 50 years old, and fewer and fewer new giants have been discovered since the decade of the 1960s (Figure 3). The average contribution from an individual giant oilfield to world production is less than 1%. Thus, with few exceptions, e.g., Ghawar, the contribution from a single field is generally small compared to the total. On this basis, our approach is to estimate collective behaviors. Fields with production over 100,000 b/d were included in our analysis, but they numbered only 20 fields in our total. Production profiles of giant fields generally have a long plateau phase, rather than the sharp “peak” often seen in smaller fields. The end of the plateau phase is the point where production enters the decline phase. We adopted the end-of-plateau as the point where production lastingly leaves a 4% fluctuation band. Fields with production over 100,000 b/d were included in our analysis, but they numbered only 20 fields in our total. Production profiles of giant fields generally have a long plateau phase, rather than the sharp “peak” often seen in smaller fields. The end of the plateau phase is the point where production enters the decline phase. We adopted the end-of- plateau as the point where production lastingly leaves a 4% fluctuation band. Each field is assumed to have a constant decline rate, and the production for an individual oil field fluctuates around some average value over time. Examples of how well this approximation agrees with actual production in a few cases are shown in Figures 4 and 5. Figure 4: The production curves of the land-based US giant Prudhoe Bay and the giant UK Thistle offshore field. The approximately exponential average decline rate is clearly seen in these two well-behaved fields. In some cases, wars, sabotage and politically motivated shut downs are evident, making these fields more difficult to describe in a simple manner. Many OPEC fields have been on a plateau for a very long time, and some were even mothballed for various periods. Nonconforming fields, such as Eldfisk, Ekofisk and some fields in Nigeria, were treated separately, and production disturbances such as guerrilla attacks or accidents were disregarded (Figure 5 not shown). 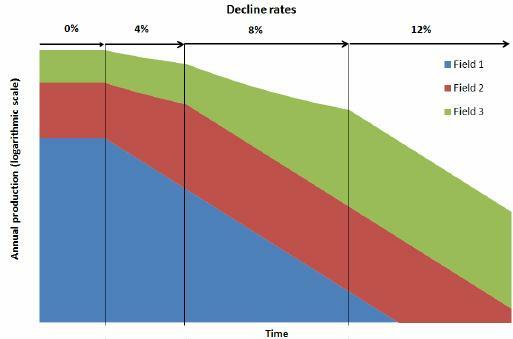 Decline curves can be made much more detailed and complicated (hyperbolic etc. ), so the simple exponential model used here should be seen as a simplified model for future outlooks. One disadvantage of the exponential decline curve is that it tends to underestimate tail production, which usually flattens out to a harmonic decline. However, the production levels far out in the tail region are generally very low compared to the plateau level, so this approximation is a minor problem for the model. In the near and medium term future the exponential decline curve is a suitable tool for realistic outlooks. Some fields can also show complex behavior with several exponential decline phases or even production collapses, where the decline can be doubled in the end stage of the field life. In other cases introduction of new technology can revive the field and significantly dampen the decline temporarily. This is the case in some Russian fields, which were reworked after the fall of the Soviet Union. However, Höök et al. (2009) found that such events are likely to result in higher decline rates later on, compensating the temporal decrease in decline rate. The Uppsala giant field database includes 331 giant oil fields with a combined estimated URR of over 1130 Gb, using estimates adopted by Robelius (2007). 214 fields are land-based (about 65% of the total), while 117 are offshore installations (about 35%). To calculate the decline rate of giants that were in decline as of the end of 2005, we considered only the 261 fields classified as post-plateau and in decline. Of these, 170 were land-based and 91 offshore. IEA (2008) gives an average depletion factor, defined as cumulative production divided by initial 2P reserves, of 48% for their super-giants and giants. Höök et al. 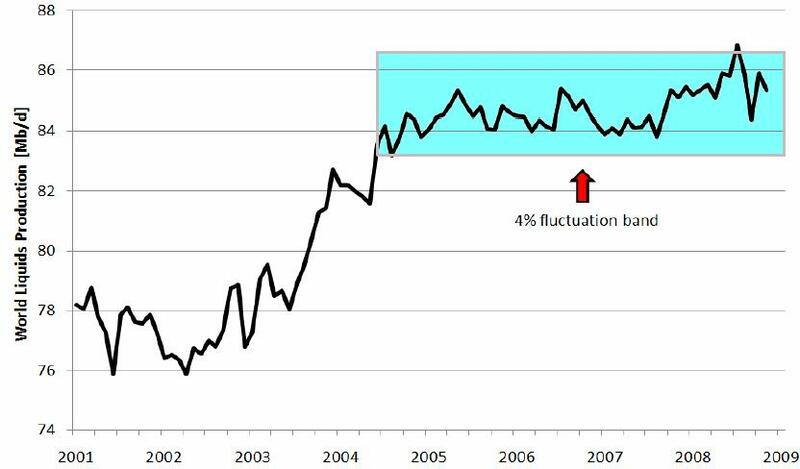 (2009) found that most giant fields leave the plateau phase and reach the onset of decline when around 40% of the URR has been produced, and combined with IEA’s average depletion factor, it is not surprising that the majority of the fields are categorized as in decline. An average annual decline rate for the world’s giant oil fields is seen to be roughly -6.5%, which is in line with the average observed decline rate worldwide of -6.5% and the -5.8% production-weighted average annual decline rate obtained by IEA (2008). The agreement with the 5.8% production-weighted annual decline for large fields obtained by CERA (2007) is good. Land-based fields decline much slower than offshore fields, as expected and in agreement with both IEA (2008) and CERA (2007). The reason for this difference is generally the higher production capabilities built into offshore installations in order to repay expensive investments as soon as possible. Also, a significant number of land-based fields started to decline far back in time, before the introduction of modern production techniques such as water injection and other pressure managing methods. In comparison, there were virtually no deepwater offshore fields before 1970. The offshore group can be even further divided into shelf and deepwater fields, where deepwater fields tend to decline faster and shelf fields somewhat slower. The average decline of all non-OPEC giant fields is above 7%, indicating that non-OPEC production is dropping relatively rapidly. The OPEC quota system appears to have been quite efficient at moderating production and maintaining the longevity of fields, instead of extracting oil rapidly with an accompanying high decline rate. Many of the low decline rates can be found in fields in the US that peaked prior to 1970s. In fact most of the non-OPEC land group is dominated by the US giant fields. The non-OPEC offshore group is dominated by giant fields in the North Sea. Many fields, both giant fields and smaller ones, in the North Sea, show a high decline rate, for instance in Norway and the UK (Zittel, 2001; Höök and Aleklett, 2008). In comparison to the non-OPEC group, the OPEC group generally displays lower decline rates. One quite intriguing detail is that OPEC fields tend to exit the plateau phase at a lower percentage of their URR volumes. This is an explanation for the lower decline rate. Instead of a prolonged plateau, a longer decline phase with less annual decrease has generally been favored as a production strategy compared to non-OPEC. This is examined in greater detail in another study (Höök et al, 2009). An alternative explanation is that OPEC URR estimates are exaggerated, as claimed by former Aramco vice-president Sadad al Husseini (2007). It is useful to consider the historical evolution of field decline rates, since many giant fields are old and passed into decline before much of modern oil field technology was developed and implemented. The year that fields left plateau production was used to form subgroups, e.g., if a field started to decline in 1950-1959, it is included in the 1950s group and so on. We believe that the year of the onset of production decline is of greater importance because it better reflects the impacts of improved technology and alternate production strategies. From this data, it is evident that average decline rates for giant oil fields as a group are increasing with time, even though individual field decline rates are essentially constant once a field has reached the onset of decline. An important conclusion is that higher decline rates must be applied to giant fields that enter decline in the future. Prolonged plateau levels and increased depletion made possible by new and improved technology result in a generally higher decline rates. Detailed case studies of giant oilfields suggest that technology can extend the plateau phase, but at the expense of more pronounced declines in later years (Gowdy and Juliá, 2007). Our findings verify their conclusion. Since a large number of important giants are subject to enhanced production methods, such as water flooding, gas injection, fracturing or other measures, it is reasonable to expect relatively higher declines after those fields depart their plateau phase. Comprehensive discussion on development of mature oilfields and a few examples of utilization in giant fields can be found in Babadagli (2007). The collapse of production from the Cantarell field in Mexico, which was extensively subjected to technologies aimed at increasing production, meant that the field declined even faster than the government’s pessimistic scenarios (Luhnow, 2007). For all offshore fields, a clear trend towards higher decline rates over time was found. For all land-based fields, the trend is not as clear but is directionally similar. Separating OPEC and non-OPEC fields reveals larger differences. Data for the decade of the 2000s are limited because less declining field data was available as of the end of 2005. The non-OPEC land group shows an inclination towards somewhat higher decline rates. The increasing decline rate trend for non-OPEC offshore giant oil fields is much clearer. The trends for the land-based fields deviate in the 1970s and 1980s, which is probably due to the twin oil crises that occurred during those decades. For the OPEC group, a tendency towards lower decline rates is observed and can be explained by the fact that fields were taken from their plateau phase for political reasons, resulting in subsequent less steep decline rates. Without good data on a large fraction of the world’s oil fields, an accurate estimate of future global oil production cannot be developed. While various databases exist, all include approximations and estimates, so none are fully definitive. Nevertheless, a number of factors can provide insights into what might evolve. First, the world’s giant oil fields are the dominating contributors to total world oil production. Second, it is found that the decline of smaller fields is equal to or greater than those of the giants (see for instance IEA, 2008; CERA, 2007). A detailed study of Norwegian fields showed that giants declined at an average of 13%, while the small fields, condensate, and NGL declined at 20% or more (Höök and Aleklett, 2008). A small field requires fewer wells to fully develop; hence it is more easily depleted. A large field requires many more wells, often widely separated, so it is typically depleted more slowly. High depletion rates, which are common in small fields, have been shown to strongly correlate with high decline rates (Höök et al., 2009). 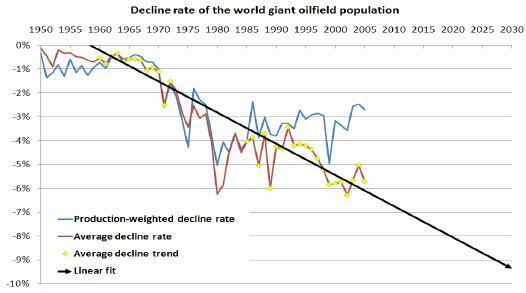 Thus, giant oil field decline rates are useful for estimating the likely average world decline. Accordingly, we believe that the decline in existing production, both for giants and other fields, will be at least 6.5% or 5.5% if production-weighted. The findings of Höök et al. (2009) indicate that the decline rates are only significant in the first digit. Consequently, we use 6% for our production outlook to reflect uncertainty. A comparison, in a field-by-field study of predominantly giant fields, IEA (2008) derived an average decline rate worldwide for all oil fields of 6.7%. IEA (2008) stated that field size was a large determinant of field decline behavior, noting that large fields decline relatively slower than small fields. This reasoning also supports their expected increases in future decline rates, as the world moves towards generally smaller oilfields. The exact annual increase in world average decline rate is difficult to estimate and requires a more comprehensive database than was available to us. Accordingly, the value of 0.15% per year derived here should be taken as a rough estimate. The important point, however, is that the average decline rate in existing production is clearly increasing with time. Also, the contribution from declining fields is increasing. Consequently, “we must run faster and faster just to stand still. Using our 6% production-weighted average decline and extrapolation of the contribution from declining fields, one can create a future outlook for world crude oil production. By incorporating the increasing average decline, another possible future can be envisioned. The difference between using a constant decline rate and a growing decline is as much as 7 Mb/d by 2030 (Figure 13). Figure 13: The historical world oil production along with a crude oil forecast using the reference scenario from IEA World Energy Outlook 2008. A constant decline rate of existing production of 6%, combined with an increasing share of fields in decline, is displayed as one possibility. Our other scenario is a case with increasing average decline. The IEA WEO 2008 forecast for fields in production (FIP) is compared to our own estimates of reasonable decline rates and the contribution from declining fields. The IEA forecast is reasonable in the near-term, but towards 2030, it seems optimistically biased. Using a constant decline rate compared to an increasing rate can mean as much as 7 Mb/d of production capacity by 2030. Based on a comprehensive database of giant oil field production data, we estimated the average decline rates of the world’s giant oil fields that are beyond their plateau phase. Since there are large differences between land and offshore fields and non-OPEC and OPEC fields, separation into different subclasses was necessary. In order to obtain a realistic forecast of future giant field decline rates, the subclasses were treated separately to better reflect their different behaviours. Thus, our average total decline rate for post-plateau giant fields of 6.5% and CERA’s overall 6.3% are in good agreement, and our 5.5% production-weighted giant field decline rate compares reasonably with IEA’s 6.5% and CERA’s 5.8%. Offshore fields decline faster than land fields, and OPEC fields decline slower than non-OPEC fields. There are small differences in the data sets and definitions between the studies, but the results from these three studies can be considered approximately equivalent. The evolution of decline rates over time includes the impact of new technologies and production techniques and clearly shows that average decline rates are increasing. This verifies the results of Gowdy and Julia (2007). Furthermore, prolonged plateau levels come at the cost of higher subsequent decline rates. This conclusion is in line with the findings of IEA (2008) regarding trends in average decline. The trends in average decline rate and production-weighted decline rate indicate that technology transfer, primarily to the Middle East, was able to dampen the decline in many highly productive fields (Figures 10, 11 and 12). This cannot continue, and ultimately, production-weighted decline must approach the average decline rate, as in the case of Norway (Figure 9). How the production-weighted decline will behave in the future is difficult to estimate, but an increase appears inevitable. Future decline rates of giant fields that have not yet left the plateau phase can be expected to be higher than those that are now in decline. This is in line with a recent statement about a decline of 10% in mature fields from Petrobras downstream director Paulo Roberto Costa (2008). The crash of the Cantarell field in Mexico and the experiences of the North Sea giants are a vivid example of what can happen to other giant oilfields in the future. These findings have large implications for the future, since the most important world oil production base – giant oilfields – will decline more rapidly. In the extreme, a potential 10% annual decline in Ghawar would be very challenging to compensate and would create severe problems for Saudi-Arabia and the world. The future behaviour of the remaining giants, especially in OPEC, will be a key factor in future oil supply. Based on the decline behaviour of giants, decline rate estimates for world oil production are possible because of the large influence of the giants. Many studies have shown that smaller fields, condensate, and NGL will decline at least as fast or faster than giant oilfields, once the onset of decline is reached (CERA, 2007; Höök and Aleklett, 2008; IEA, 2008). Consequently, we believe that there is a strong basis for believing that giant oilfields can be used to set a floor for future decline rate assumptions. In conclusion, this analysis shows that the average decline rate of the giant oil fields have been increasing with time, reflecting the fact that more and more fields enter the decline phase and fewer and fewer new giant fields are being found. The increase is in part due to new technologies that have been able to temporarily maintain production at the expense of subsequent more rapid decline. Growing average decline rates have also been noted by IEA (2008). The difference between using a constant decline in existing production and an increasing decline rate is significant and could mean as much of a difference of 7 Mb/d by 2030 (Figure 13). By 2030 the production from fields currently on stream could have decreased by over 50% in agreement with IEA (2008). The struggle to maintain production and compensate for the decline in existing production will become harder and harder. Our conclusion is that the world will face an increasing oil supply challenge, as the decline in existing production is not only high but also increasing. IEA (2008) uses a similar classification in their study. IEA classify “super-giants” as fields with more than 5 Gb of initial 2P reserves, “giants” contain more than 500 million barrels of initial 2P reserves, and “large fields” contain initial reserves of more than 100 million barrels. In IEA (2008), super-giants are treated as a subclass, while this study includes them in the giant category. In total, IEA covers 317 super-giant and giant fields, which makes their data set similar to ours. Their production-weighting is done by using the cumulative production of each field in the averaging. CERA (2007) did not treat giant oil fields in the same way as this study. Instead their study was performed on a set of “large fields”, classified as fields with more than 300 million barrels of originally present 2P reserves of oil and condensate. In total, their dataset represent 1,155 billion barrels of original 2P reserves in place, accounting for approximately half the current annual global production. Consequently, their dataset is deemed approximately equal to the data set used in this study. When it comes to production-weighting, CERA (2007) takes each field’s latest oil and condensate production into account for the averaging. Because of financial and practical differences between land-based and offshore fields, a division is needed to establish a comprehensive picture of how each subclass behaves. A further division into OPEC-fields and non-OPEC fields was also made to better reflect the potentially different behaviors of giants managed with no political restrictions on production and those sometimes limited by quota systems. OPEC controls or formerly controlled 143 of the fields in our database. Gabon is no longer a part of OPEC, but used to be a member; consequently, their fields were classified as OPEC-fields because they were previously subjected to the quota system. Ecuador suspended their OPEC-membership, but recently rejoined the organization. In total, OPEC has 104 land and 39 offshore fields in our database. Outside of OPEC, 190 fields were considered with 110 fields onshore and 78 offshore. The North Sea, Russia and the US were the most important regions within the non-OPEC group. The decline rate of a field is affected by introduction of new technology, investments, changes in strategies and other factors affecting production. The statistical uncertainty is difficult to estimate, since production data contains political influences, differences in definitions, reporting practice and many other parameters, making conventional statistical error estimate hard to apply. Traditional statistical analysis was based on the assumption that production data measures approximately the same thing, and results in standard deviations of around 5% and may be seen as a rough attempt to put a number on the inaccuracy (Höök et al., 2009). In comparison, neither IEA (2008) nor CERA (2007) provides any uncertainty estimates and hence it is hard to judge the statistical variations in their results. Because the number of fields is so large, our approach provided reasonable statistics and reasonable mean, median and production weighted values for the giant oil fields as a group. The production weighted values were created by weighting the decline rate against the peak or plateau production level for each field, thus giving greater importance to fields with high production. The production weighted decline is lower than the mean value, because fields with high production levels often tend to be larger and decline slower than the rest. Arps, J.J, (1945); Analysis of Decline Curves, Transactions of the American Institute of Mining, Metallurgical and Petroleum Engineers, 1945, 160, 228-247. Doublet, L.E, Pande, P.K, McCollom, T.J, Blasingame, T.A. (1994); Decline Curve Analysis Using Type Curves–Analysis of Oil Well Production Data Using Material Balance Time: Application to Field Cases, Society of Petroleum Engineers paper presented at the International Petroleum Conference and Exhibition of Mexico, 10-13 October 1994, Veracruz, Mexico, SPE paper 28688-MS, 24 p.
Duroc-Danner, B.J., 2009, Game-Changing Technology: The Key to Tapping Mature Reservoirs, World Energy. Vol. 5, Issue 1, February 9, 2009. Campbell, C., (1991); The Golden Century of Oil, 1950-2050: The Depletion of a Resource, first edition, Springer, 29 October 1991, 368 p.
Nehring, R., (1978); Giant Oil Fields and World Oil Resources, Report prepared by the RAND Corporation for the Central Intelligence Agency, June 1978. This entry was posted in Flow Rate, How Much Left, Peak Oil and tagged deline rates, depletion, giant oil fields, land, non-opec, offshore, OPEC, peak oil. Bookmark the permalink.